What's the time Mr... Giraffe?! What’s the time Mr… Giraffe?! Consult your clock, but I think it’s time all little monkeys were in bed! 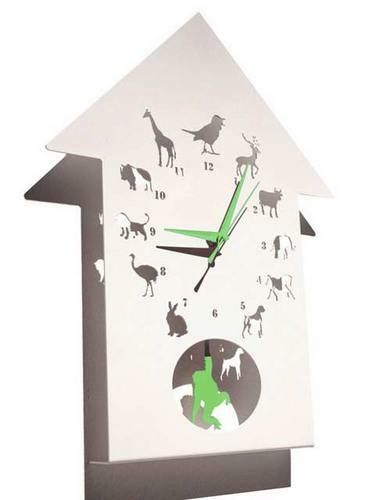 The fabulous Animalask Clock by British designer Polly Westergaard features a variety of animals, giving children a whole new way to learn how to tell the time. I like the monkey swinging on the pendulum at the bottom and I’m sure my kids would have fun letting me know that it is rabbit o’clock and therefore breakfast time or deer o’clock and therefore lunch time. The clock is made from powder coated steel and is available with green or pink hands. Available from Hunky Dory Home for £45, the clock can be shipped to Australia. Also check out our previous feature on cuckoo clocks.